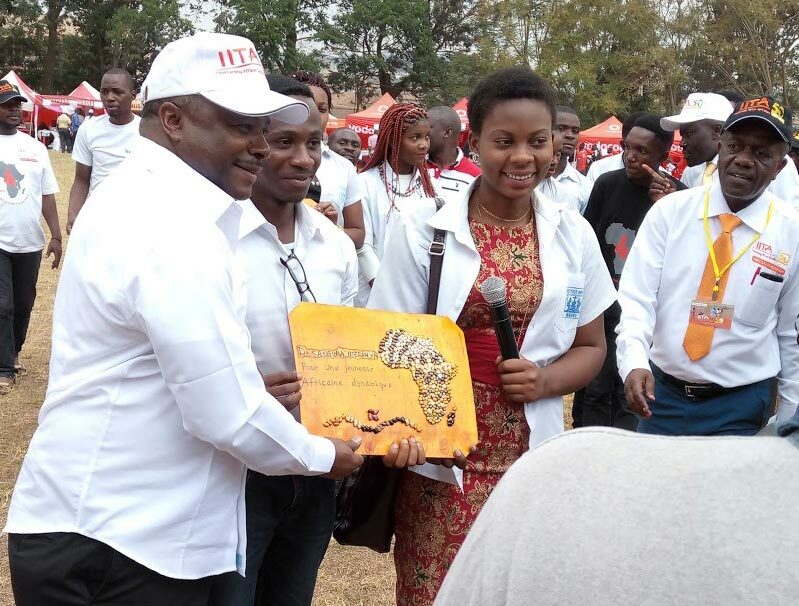 IITA-Kalambo Station celebrated the IITA50 Anniversary on 29 June at College Alfajiri premises Bukavu, South Kivu Province, DR Congo with the theme “Youth in Agripreneurship”. Thirty-four enterprising youth groups exhibited their products in an exhibition. Colorful balloons were released into the sky to set the golden jubiliee celebrations in motion. 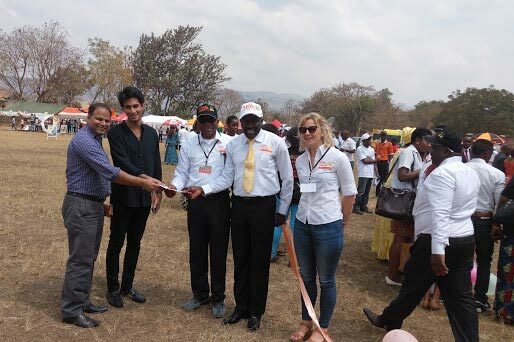 The IITA Kalambo Youth Agripreneurs (IKYA) exhibition stand was the center of attraction with different types of agricultural produce and processed products. The event attracted hundreds of youth, public agencies, other CGIAR centers, universities/research institutes, international development organizations, local NGOs, corporate bodies, and farmers’ associations. 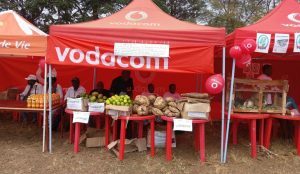 Many of the corporate bodies and development partners mounted exhibition booths to share information on their collaborative efforts with IITA to promote youth-led agri-enterprises. 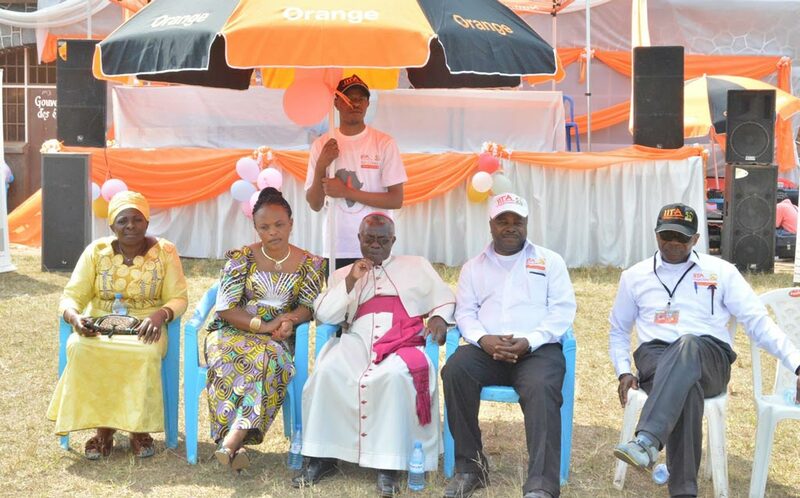 Dignitaries who graced the event included the IITA Director General, Nteranya Sanginga; the representative of the Governor of South Kivu, the Provincial Minister of Agriculture and Rural Development, Adolphine Muley Byayuwa; Mwanza Nangunia, Minister of Health and Gender, Tanganyika Minister of Gender; the Archbishop of South Kivu, His Eminence François Xavier Maroy, a representative of the Provincial Parliament, Honorable Kinja Mwendanga; and a representative of traditional chiefs, His Majesty Mwami Roger Ntambuka. In his opening remarks, the Officer-in-Charge (OiC) IITA Station in Kalambo, Chris Okafor, extolled the contributions of IITA towards improving the lives of smallholder farmers in sub-Saharan Africa. Okafor commended the organization’s leadership for broadening its focus and making the youth agenda mainstream. 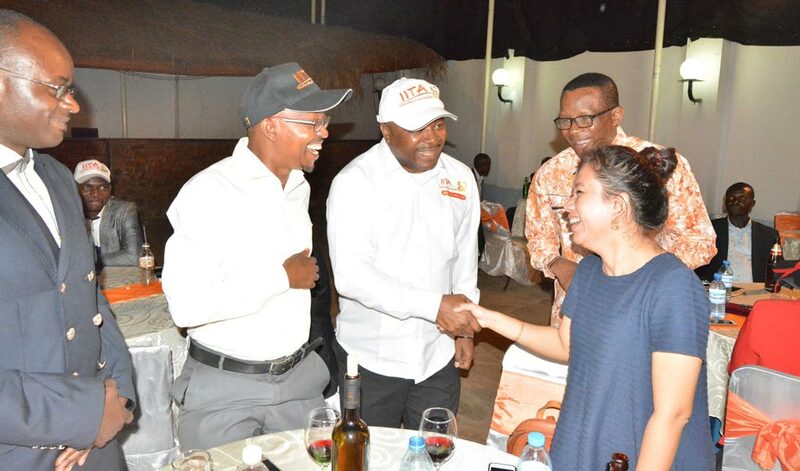 “For the past five years IITA has directed its attention towards mobilizing and directing the youths’ energy towards agri-enterprises, an innovation that is now spreading to many African countries.” said Okafor. 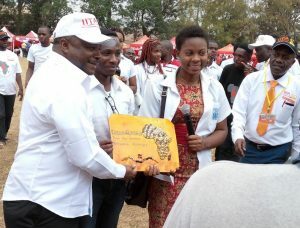 Chris Okafor, OiC, IITA in Kalambo accepts an award on behalf of IITA at the ceremony. Addressing the audience on behalf of the South Kivu Governor, the Provincial Minister of Agriculture and Rural Development, Adolphine Muleyi, said that the IITA-youth agripreneur initiative is a valuable idea for agricultural development and needs to be supported by all stakeholders. 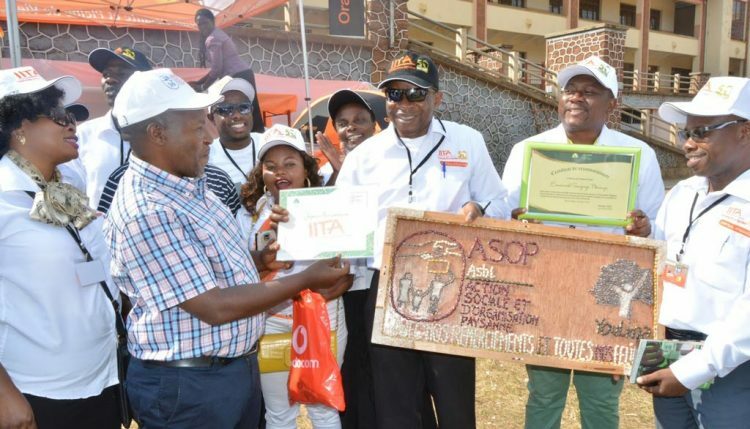 “On this date of the 50th anniversary of IITA, we ask the South Kivu population to encourage the young generation to invest their capital asset and knowledge in agricultural entrepreneurship for the well-being of all the entire population of the Province,” she added. Archbishop Maroy, expressed hope that the IITA Youth Agripreneur initiative will stimulate other youths to engage in agri-enterprises. In his press interview, DG Sanginga remarked: “My greatest satisfaction today is to see all these young people who are engaged in agribusinesses. I think they have chosen the best way to assure their future,” he said. After a tour of the exhibition booths, prizes were given to the three best exhibitors selected by a panel. 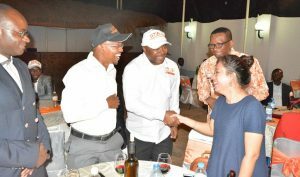 The celebration ended with a party at Hotel Residence, Bukavu. An array of agricultural products finished and fresh were displayed during the celebrations. 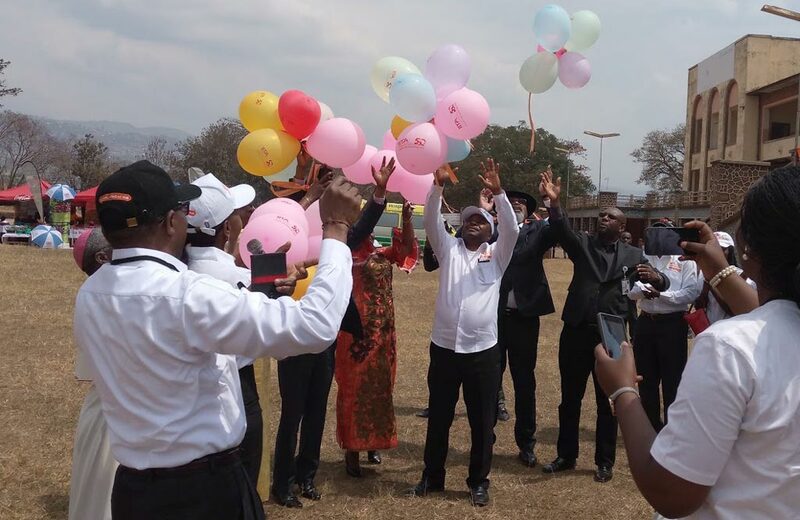 Staff, scientists, partners, and friends of IITA in Bukavu had a great time during the celebrations in Kalambo. DG Sanginga accompanied by Chris Okafor OiC, went round welcoming all to the event.